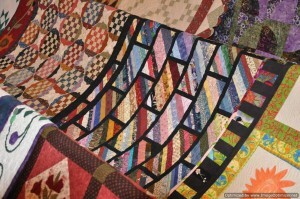 On Saturday, I attended the Countryside Quilters first quilt show. 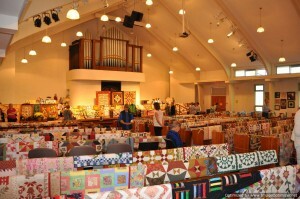 Despite the small number of members–only 27–this group put on a huge show–over 400 quilts!!! 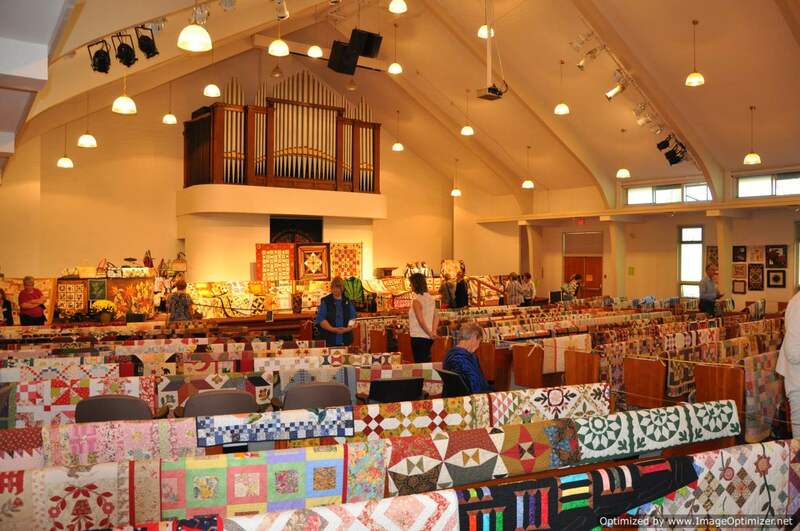 I have seen pictures of quilts displayed in the sanctuary of churches before but I had never attended a quilt show in person where the quilts were displayed in this way. The golden glow created by the lighting in the church combined with the colours of the quilts made the display breathtaking. I was glad I was there first thing in the morning though as the aisles quickly became crowded. 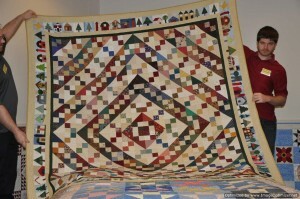 I really liked this scrap quilt. I am going to have to try this layout for some of my string blocks in the future. 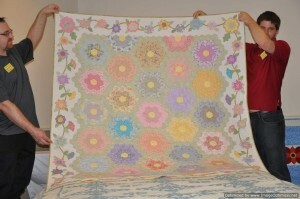 I have a maverick star quilt on my list of quilts to make. 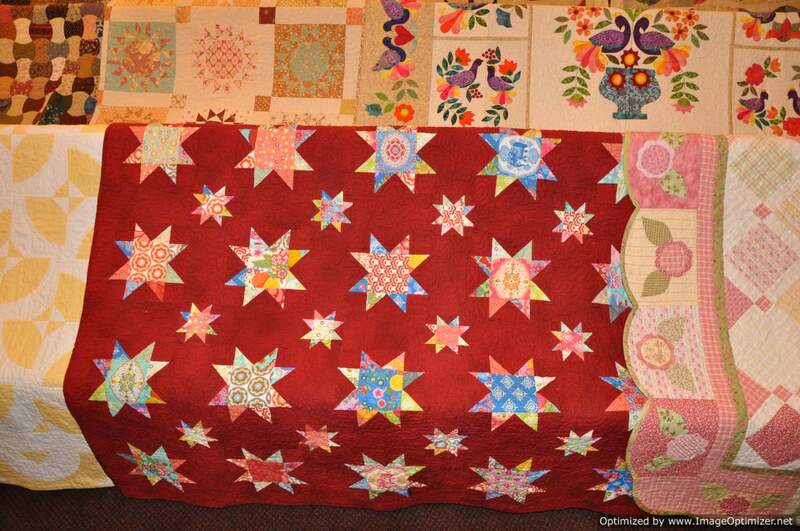 I really like the effect of the red background on this star quilt. Red is not always a colour that you see as a background, but it really works on this quilt. 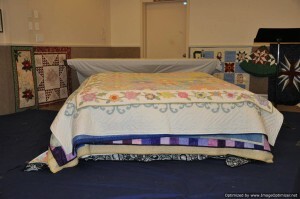 The group also hosted old fashioned bed turnings at different times during the day. I was there for the 10:30 bed turning. One of the group members told me that the quilts displayed during the bed turning were not necessarily the fanciest quilts, but they were the ones with the best stories. She was right–many of those stories were enough to bring you to tears. For a slideshow of more pictures of the show, click here. 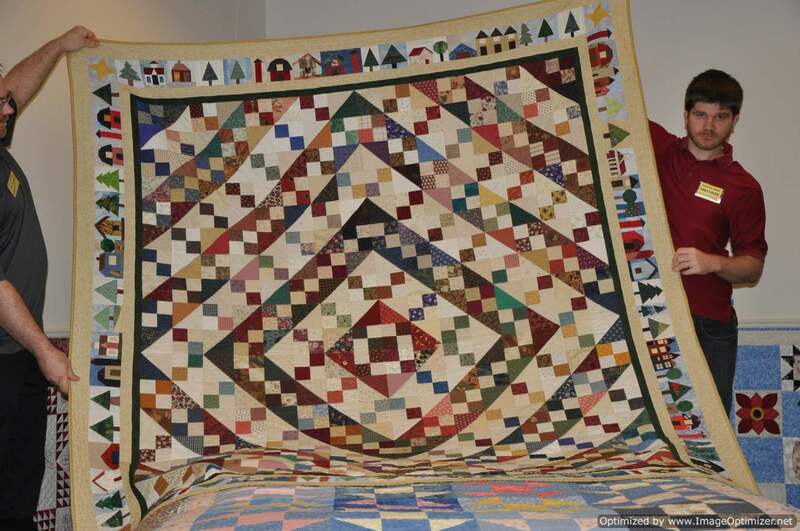 This quilt show proves that you don’t have to have a huge membership to put on a great display of quilts! Update: I found another slide show on YouTube that someone else had posted for this show. It is always interesting to look at someone else’s pictures for the same event that you attended to see things from their eyes. Click here to enjoy! This entry was posted in quilt show, scrap by Norma Hanson. Bookmark the permalink. 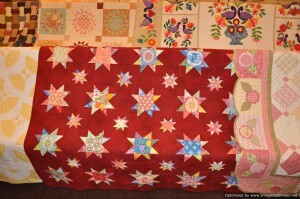 The string quilt is an interesting set but I love those stars on the red background! Very striking and reminiscent of quilts of the past. These ladies must have quite a collection of quilts to show that many in spite of their group being small in number.